Situated on a clean stretch of the golden sands of Benaulim Beach, this is an offering of a one-bedroom rustic hut, which can accommodate up to three guests. The area has the most spectacular views of the sea, sand, and tall palm trees, and the retreat is ideal for beach bums. Your Space This holiday home features a porch sit-out where you can lounge and spend time basking in the tropical sun. 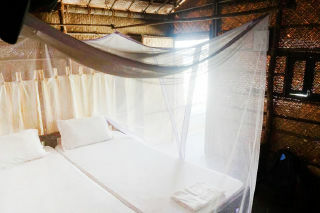 The hut has two comfortable single beds placed side by side, with a mosquito net that covers both. A utility table and storage shelf are available in this space. The bathroom is compact and fitted with western sanitary ware. After a long day at the beach, unwind over a game of pool in the recreational hall, which features similar thatched exteriors and exudes a laid-back vibe. The in-house restaurant is the ideal place to spend your evenings. The space is furnished with cushioned cane chairs and barstools. Guest access You are allowed access to the in-house restaurant where you can relish a meal or two. The property also has a recreational area, perfect for you to entertain yourself with a game of pool. Guest interaction A caretaker and a manager are present in the property premises to assist you. Also, we are just a phone call away. Neighbourhood overview The nearby attractions from the property that you can visit are- Florida Gardens- 95 m Betalbatim Beach- 5.1 km Cansaulim Beach- 10.7 km Getting around Our holiday home is located 24 km away from Goa International Airport. You can avail a local cab to reach the property conveniently. Additional information You are requested to provide valid ID proof at the time of check-in. We do not lend our home to a group of bachelors. We regret any inconvenience this may cause. Travel assistance is available. Car rental is available. One of only a handful of truly beachside places on this entire strip of coast, this place offers simple beach huts & a nice beachfront restaurant which gain stellar reviews from guests. Besides internal accommodation, a front desk, restaurant, room service, laundry and a concierge are few of the conveniences offered to the guests.Other services include:Massage,Water-sports,Taxi services,Site seeing,Dolphin trips. "Beach-facing romantic huts, rustic charm, set amidst nightlife and fine dine spots"
It was a memorable experience. We were greeted by a great host who had everything ready for a quick check-in. The room was well-kept and the bathroom clean. They helped us with our travel arrangements and also provided us with some helpful tips. We really enjoyed our time here. Everything was perfect. The huts were clean and spacious. Loveddd the sea!! !